We’d love your help. Let us know what’s wrong with this preview of The Secrets of Consulting by Gerald M. Weinberg. Through the use of vividly memorable rules, laws, and principles -- such as The Law of Raspberry Ja If you are a consultant, ever use one, or want to be one, this book will show you how to succeed.With wit, charm, humor, and wisdom, Gerald M. Weinberg shows you exactly how to become a more effective consultant. He reveals specific techniques and strategies that really work. -- create a special "consultant's survival kit"
To ask other readers questions about The Secrets of Consulting, please sign up. One of the best and most enjoyable business books I've read. Certainly on my top 10 list. I came across this in some IT book club -- it was a $30 paperback and I was aghast. Have since probably bought and given out 50 copies (Gerry, you can send thanks) to engineers, auditors, and others who need to bring humor and sense to situations. It has sayings: "Things are the way they are because they got that way." Remember it. This book is a very quick read because it is a bunch of ProTips smashed together. I had a co-worker tell me that this is a book from the point of view of an old school consultant. I think the consulting work I will be doing will somewhat relate to what Weinberg has written, but it will also be more structured as well. - There is This book is a very quick read because it is a bunch of ProTips smashed together. I had a co-worker tell me that this is a book from the point of view of an old school consultant. I think the consulting work I will be doing will somewhat relate to what Weinberg has written, but it will also be more structured as well. - "Whatever the client is doing advise something else"
- "If they don't hire you don't solve their problem"
- "Don't be rationale; be reasonable"
- "The orange juice test: We can do it - and this is how much it will cost." - Can't fix - feature ~ Can't feature - fake ~ If you fake it, it must need to be fixed. Featuring is spin, but faking is lying and bad all around (including using euphemisms). - "Study for understanding, not for criticism"
- "The name of the thing is not the thing"
- When doing interviews: "Clients always know how to solve their problems, and always tell the solution in the first five minutes"
This section is all about following you intuition, and recognizing when the problem might be what's missing, not what is in front of you. - "Be aware of your own limitations"
- "Sometimes far-fetched is only shortsighted"
- "If you can't think of three things that might go wrong with your plans, there is something wrong with your thinking"
- "Look outside the boundary"
- "Look for alibis versus Explanations"
- "Words are often useful, but it always pays to listen to the music"
- "What you don't know may not hurt you, but what you don't remember always does"
- "If you know your audience, it's easy to set triggers"
- Jiggling: un-sticking the system (overload and communication) and remember less is more. - Try to change awareness and perceptions by understanding internal behavior and feelings. - "Some of the time, in some places, significant change happens - especially when people aren't working hard at it." - "Cucumbers get more pickled than brine gets cucumbered." - "The best way to lose something is to struggle to keep it." Big and lasting change originates in trying to preserve the thing that will probably change most. - Put your money where your mouth is to get people to show you their confidence in the system. - "Nothing new ever works, but there's always hope that this time will be different." Back ups are important, and make sure that you only make one new change at a time. - "Trust everyone, but cut the cards." - "When you create an illusion, to prevent or soften change, the change becomes more likely - and harder to take." - "You can make a buffalo go anywhere, just so long as they want to go there." 2: The more they pay you, the more they love you. The less they pay you, the less they respect you. - "Never be dishonest, even if the client requests it." 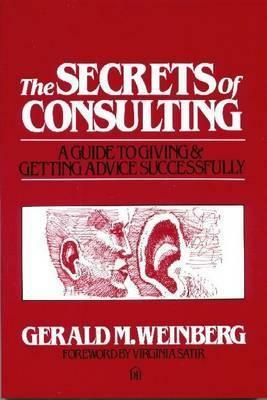 The Secrets of Consulting by Gerald Weinberg is a book about the learning and wisdom of Weinberg's consulting career. The Secrets of Consulting from the outset seems like it is specifically aimed at consultants or perhaps employees in larger corporations but as soon as you read it, you instantly become aware that this book contains advice and wisdom for your life. While all of the advice usually centers around consulting cases it is most of the times applicable for your life as well. As a result The Secrets of Consulting by Gerald Weinberg is a book about the learning and wisdom of Weinberg's consulting career. The Secrets of Consulting from the outset seems like it is specifically aimed at consultants or perhaps employees in larger corporations but as soon as you read it, you instantly become aware that this book contains advice and wisdom for your life. While all of the advice usually centers around consulting cases it is most of the times applicable for your life as well. As a result this book becomes a lot more than advertised. The style of the book is also delightfully conversational. It never becomes a bore to read due to Weinberg's ability to illuminate his learning in a funny and personal way. It however also backfires sometimes where I was not sure how true an anecdote was. Somehow it bothered me a bit, if I can't trust the author, how can I trust anything else in this book. All in all a good book on consulting, on work and on life. The lessons from this book are applicable to most situations in your life and in your work. Very thought provoking and humorous book. Although it leaves the reader with more questions than answers it definitely contains numerous advice on the subject. I only wish I read it before I started to be a consultant. Laws of life, with a great Jerry Weinberg's spice! If something going wrong, probably it's you. If it's not you then it's definitely other people. But never tools or situation. Worth reading for everyone involved in business. Finished the book in three days and enjoyed it very much. Afterwards I wish I’d read it earlier, and I’d like to compare it with How to Win Friends and Influence People. Both books introduce a lot of principles, backed by enjoyable and memorable stories, that you can apply to your life—for great effect—right away. Also, it finishes off with a great list of other books you might enjoy reading on different subjects; one of them being the book I just mentioned. Entertaining and highly educational. Will have to return to this. Этот тот редкий случай, когда мои ожидания от книги не оправдались. Прочитав первую главу я был просто в абсолютном восторге! Вся глава в заметках, столько мыслей и эмоций! Автор не просто жжот, он познал мир, корпоративную культуру и явно узнал ответ на вопрос Вселенной и всего такого. Но дальше что-то пошло не так. Да, законы консалтинга применимы в жизни, они интересны, из них можно почерпнуть чего-то полезного. Рассказанные истории поучительны, хотя возможность применения на себе немного сомни Этот тот редкий случай, когда мои ожидания от книги не оправдались. Но дальше что-то пошло не так. Да, законы консалтинга применимы в жизни, они интересны, из них можно почерпнуть чего-то полезного. Рассказанные истории поучительны, хотя возможность применения на себе немного сомнительна. Восторг пропал ... и так и не вернулся. В конце книги количество заметок на полях сошло на нет, что для меня является главным показателем падения интереса к книге. Why do consultants fail?How do I become a consultant of repute?What are the skills needed to become a consultant? If these and some other questions come to your mind when you think of consulting as a career,here is the book that should be really helpful.In a simple and lucid way the author has drawn upon his rich experiences and the daily lives' chore to make the reader understand the intricacies of becoming a successful consultant. Looks like a lot of advice given in a very approachable and brief format. Lots of insight into human interactions, and not a lot of fluff and sunshine. It is one of two Weinberg books I currently own, and I'm realizing that two is not nearly enough. This is a very honest and forthright book about consulting. It is also quite funny. It's not just a book for consultants, but also for people who use the services of consultants. I think I can get the most mileage out of it if I can entice my clients to read it. Recommends it for: Anyone who needs to work with and influence others. A book can only do so much, but this book is the closest thing I've ever seen to a howto guide to consulting. A person could do some good, and make a very comfortable living just following Carl Weinberg's advice. This is especially useful for technical consultants. Read this book if you are new to consulting, otherwise you may already know much about what you may find here. Poorly written with self evident consulting half-truths like "don't make any promises" and "it takes years to earn clients' trust but moments to lose it". Gee thanks. Very easy to read. Good advices regarding prices, trustworthiness, and recommended books in the end. Many timeless lessons that can be applied in any work environment. Weinberg is a master of extracting the human personality required to run modern business. He describes one of his art-forms in this introduction to consulting practice. This book does not focus merely on short heuristics on how to consult. It instead goes in-depth into the psyche required to succeed as a consultant. He defines consulting as the art of influencing people at their request. He then describes a rational framework for this practice and how communication can succeed through humility an Weinberg is a master of extracting the human personality required to run modern business. He describes one of his art-forms in this introduction to consulting practice. This book does not focus merely on short heuristics on how to consult. It instead goes in-depth into the psyche required to succeed as a consultant. He defines consulting as the art of influencing people at their request. He then describes a rational framework for this practice and how communication can succeed through humility and the proper management of change. This latter topic (the management of change) is where Weinberg is at his best. He distills his advice in rules or laws that govern the enterprise. Often these laws seem paradoxical or unusual at first. Then he supports these laws with interesting anecdotes that bring the truth to the fore. As such, he prepares the landscape of consulting for those new to the practice. Landmines are able to be anticipated and avoided instead of exploded with pain. At the very least, Weinberg's voice needs to be heard because of his incredible self-awareness. Instead of approaching the matter as mere science and facts, Weinberg artfully describes the human component in consulting - since it is the art of influencing people, at their request. Anyone who wants to get better at navigating the thorny roads of human feelings and human nature would benefit from reading Weinberg's take. Not just for people who make a living as "business consultants" but applicable to anyone looking for fresh and counter-intuitive insights on learning, changing, improving, helping, and life. Don't be shy about skipping around and you'll find gems all over. One of the many lines from the book that sticks with me: "Past glories are future graves." Don't focus on protecting what's "yours" and living off of your past accomplishments. I realized that's what I did. I needed to keep learning and trying Not just for people who make a living as "business consultants" but applicable to anyone looking for fresh and counter-intuitive insights on learning, changing, improving, helping, and life. Don't be shy about skipping around and you'll find gems all over. A good book that describes trust and integrity. People, either clients or spouses, need to know what you can and cannot do. Great book full of useful advice and funny stories. Lots of Laws and Rules that are summarized at the end, plus an excellent list of suggested reading. Chock full of great content. I would recommend anyone in consulting give it a read. It was ok, this is more geared towards consultants who work alone, so some information wasn't really relevant. Finally got around to reading this one, it's funny and has some truisms that you probably do already.